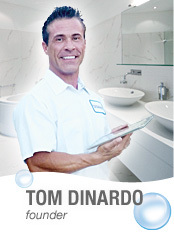 Tom DiNardo started his plumbing company in 1998 at the young age of 26. It didn't take long for larger, more established companies to notice how quickly DiNardo was becoming a success in San Diego, without financial backing! Tom DiNardo recognized early on that the industry lacked sincere customer service and appreciation. Tom DiNardo saw that while many companies claimed to be customer service oriented, their actions didn't back those claims, and as we all know, "actions speak louder than words!" Tom DiNardo Plumbing doesn't claim to be the low cost leader – Tom DiNardo Plumbing promises priceless, sincere customer appreciation backed with great service and quality parts. Most importantly, our technicians aren't only experts in the plumbing trade, they are also courteous, well-mannered, and polite – guaranteed!